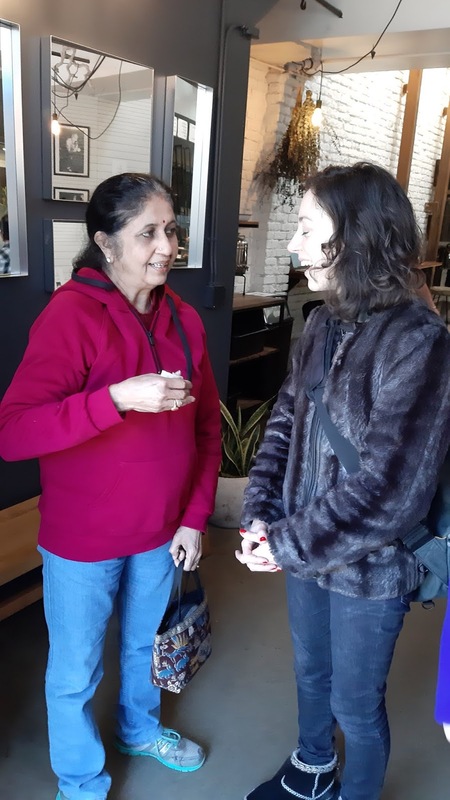 Shobana P Rao Cooking Enthusiast & Food Blogger, sharing a collection of Indian recipes, some cooking tips and useful hints. These days frozen peas are available in many houses as they are indeed time savers. They come in handy to make dishes in a jiffy. I too use frozen peas quite often. They save you the time spent in cleaning and shelling them as well. 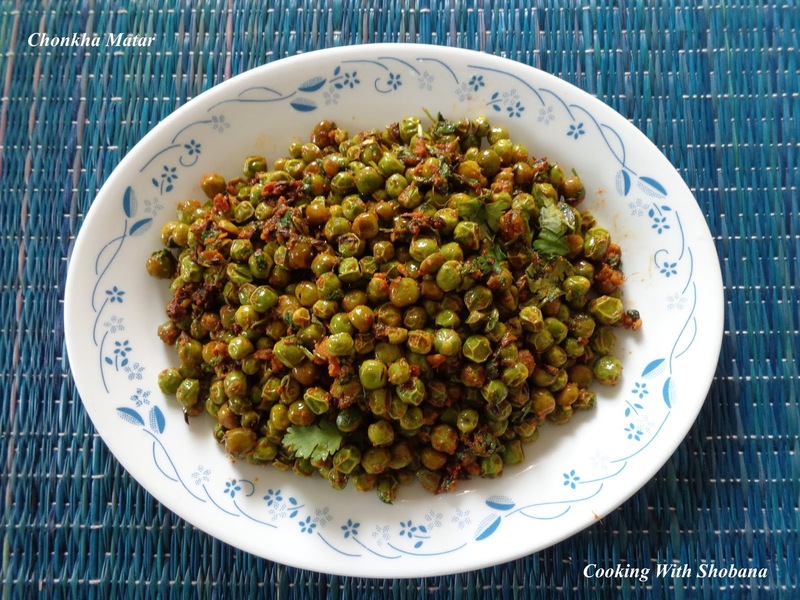 Elsewhere in this blog, you will find recipes for Green Peas Spicy Gravy, Green Peas Masala, and Green Peas Red Gravy. Today's recipe is for an easy to make side dish from Uttar Pradesh called Chonkha Matar which I have adapted from Khaana Khazana by MasterChef Sanjeev Kapoor. As we don't use onions or garlic in making this dish, this can be one more saatvik dish in your collection. You can garnish this dish with ginger juliennes but I have not done that. I tried out this dish and we enjoyed it very much. Heat oil in a thick- bottomed non-stick pan and on medium heat add the cumin seeds and when they sizzle, add the chopped ginger and green chillies and saute. 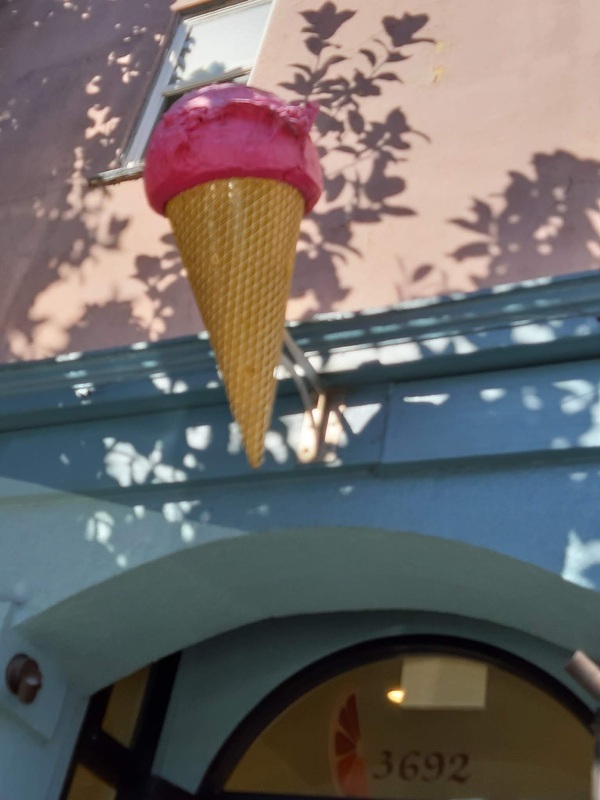 In the summer months, anything cool is most welcome. In the South of India, we make a drink which we call "Paanaka" which is usually made with lemon. 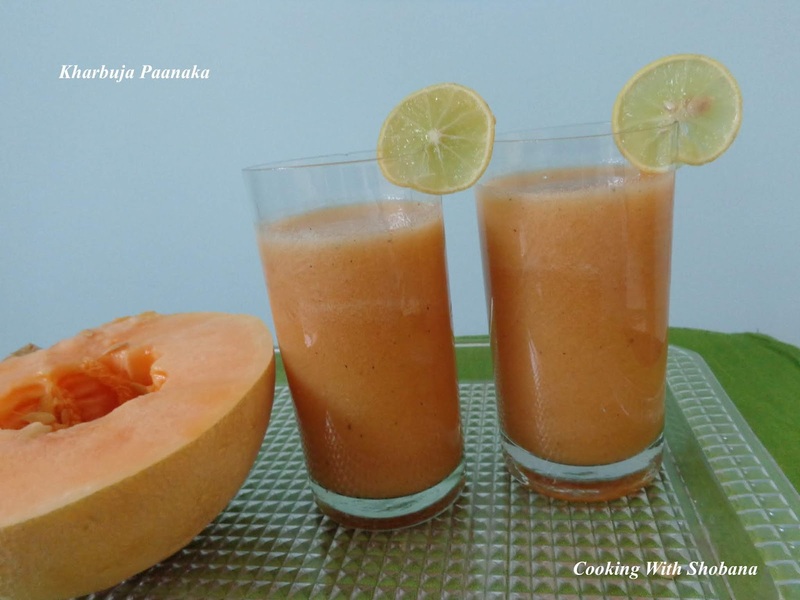 Today's paanaka is made using muskmelon, which is a fruit most commonly available in the summer. We call muskmelon "Kharbuja" in Kannada so today's drink is called "Kharbuja Paanaka." You can make this as thick or dilute depending upon your preference. I, for one, would opt for the thicker version. It is advisable to blend the pulp first and later add the water in a separate vessel as adding the water in the blender itself may not be feasible. Once you add water, you can bring it to the consistency you desire. After adding water, it is better to check for sweetness before you serve the paanaka because the taste would also depend on the sweetness of the muskmelon. Wash and cut the muskmelon into two halves. Remove and discard the core and seeds. Remove the muskmelon pulp using a scoop or a spoon and keep aside. Usually for breakfast, we make the more common items like idli, dosa, upma etc. In my home state of Karnataka, we also make Akki Rotti etc for breakfast. In Kannada, "Berake" means "mixed" therefore today's easy to make breakfast dish is called Berake Rotti as it is made using different flours that are mixed together. 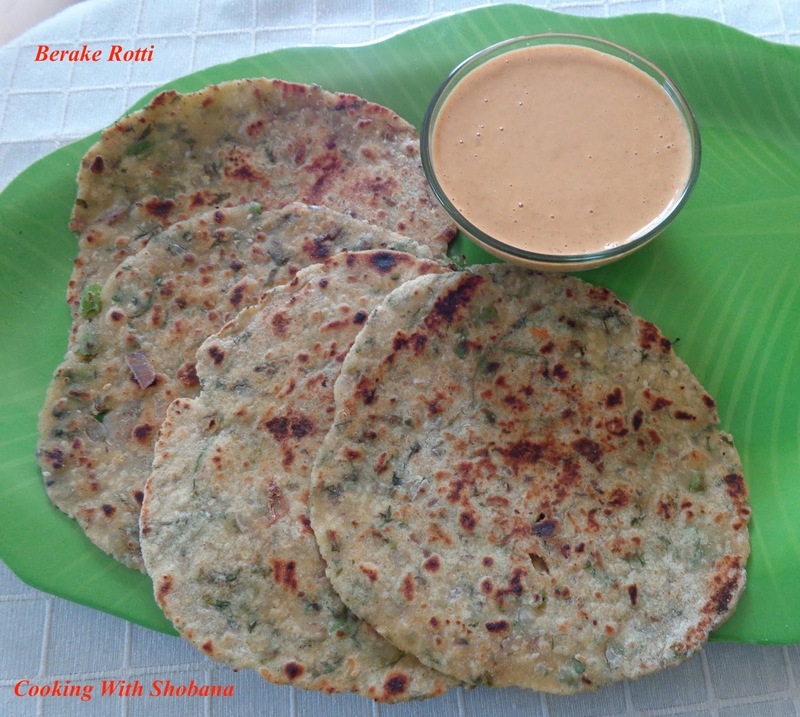 This recipe is adapted from "Berake Rotti" from the popular website Shetty's Kitchen which I came across in Facebook. Once in a while, I like to make dishes using Baby Onions, which are commonly known as Sambar Onions in South India. These cute onions enhance the aroma and flavour of the dish. Elsewhere in this blog, you will find recipes for Shallot Sambar, from the South of India, and Pyaz ki Subzi, from the North of India. These days we get baby onions in a peeled and packed state. However, if you have bought them as they are you would need to peel them first. This can be quite tedious but I can assure you that this tasty dish is well worth the effort. 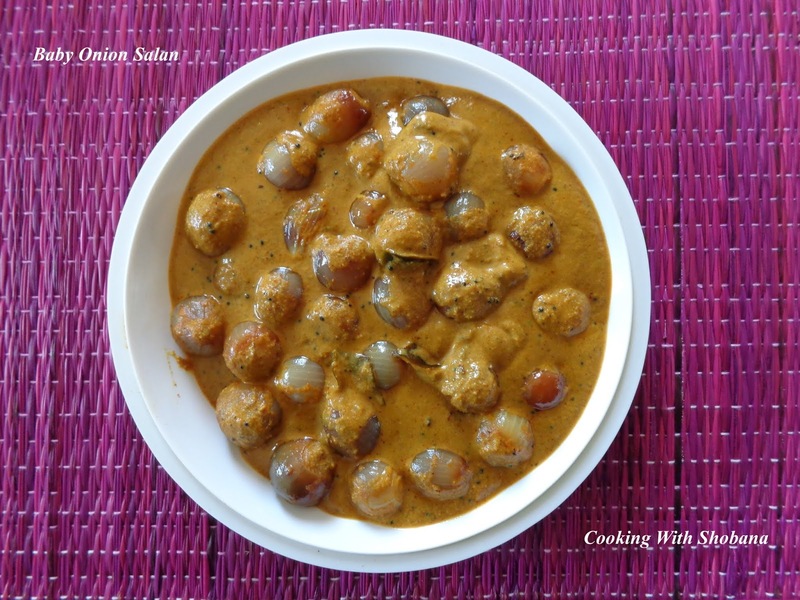 Today's recipe is from Hyderabadi cuisine and is adapted from Pyaz ka Salan by Yummy Tummy. Salan is a side dish made with a masala made from groundnuts, sesame seeds, coconut and spices. We had this as a side dish with rotis and it tasted quite delicious. Transfer to a small blender jar and grind this to a smooth paste adding just the required amount of water. Keep aside. In the same pan, heat oil and on medium heat add the mustard seeds, when they splutter add the fennel seeds and cumin seeds, when they sizzle add the cinnamon stick and lastly the curry leaves. Saute for a few seconds. Next add the turmeric powder, chilli powder, coriander powder, cumin powder, and Kitchen King Masala and salt. Mix well. Dill Leaves, called Shepu in Konkani and Marathi and Sabsigge Soppu in Kannada, have a smell and flavour of their own. In my experience, dill leaves triggers two reactions from people. Some love the flavour and smell while others don't ! There is seldom a neutral reaction. I love dill leaves and use them in dishes whenever I can. Elsewhere in this blog, you will find recipes like Moong Dal with Dill Leaves, Nuchina Unde, and Lobia Suva Bhaji Subzi which make use of dill leaves. 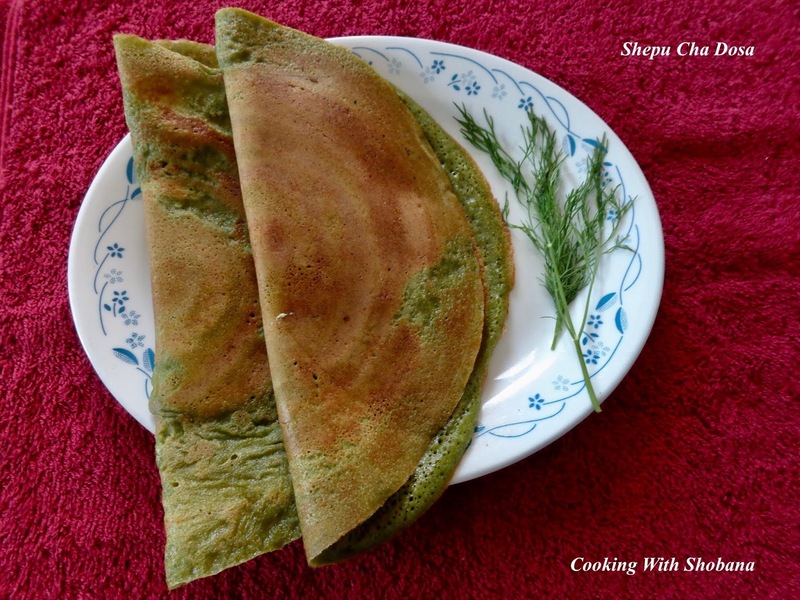 Today's recipe is a dosa called Shepu cha Dosa, from Maharashtrian cuisine which has dill leaves and jaggery too. While the jaggery adds sweetness to the dosa, please note that too much of jaggery will make it difficult to make the dosas. Do try it out. I am sure you will love it - if , like me, you are one of those who enjoy the flavour of dill leaves. You can use ghee or oil to make these dosas. Ghee enhances the taste but you can use oil depending on your preference and what you are used to. This recipe has been adapted from Shepu cha Dosa, by Kalpana Talpade of Kalpana's Kitchen. There are some dates that stay firmly planted in your memory. March 21 is one such for me! I am so pleased to share that this blog completes 6 years today. It was on March 21, 2013 that I posted my first dish. It is with quiet satisfaction that I see that since then there have been 677 posts which have received over 2.5 million hits. 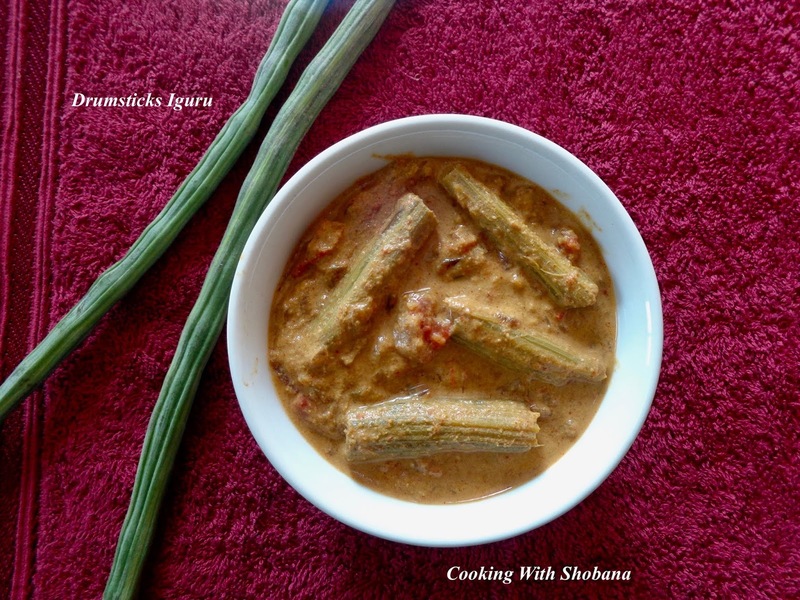 The Facebook Page for Cooking With Shobana has over 16,000 likes and the blog continues to feature in the Top 100 Indian Food Blogs and Websites. I am grateful to God, and to you, my family and friends for your encouragement and support over the years. To celebrate the occasion, today I have made a sweet dish called Moong Dal Halwa, which is popular all over India. This is the Instant version which is easier to make. 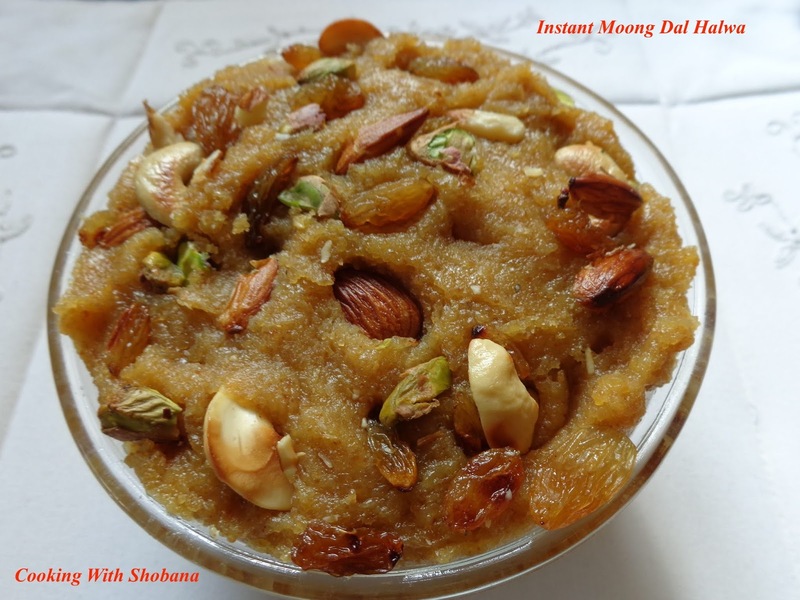 It has been adapted from Instant Moong Dal Halwa by one of my favourite cookery experts, Nisha Madhulikaji. Heat a little ghee in a pan and add the cashewnuts, almonds, and raisins. Roast them for a few minutes and keep aside. The Mission District is considered one of the most interesting localities in San Francisco, California having been established hundreds of years ago. Avril Tours has this interesting initiative for those interested in local culture and food. 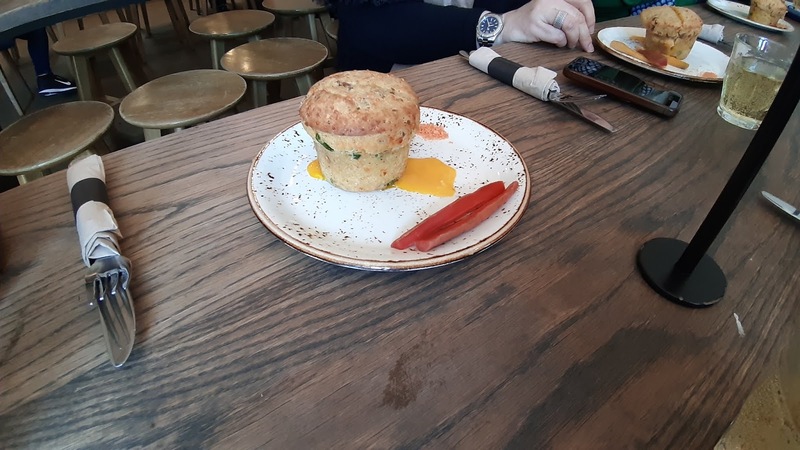 In the course of this conducted tour, we walk about the district for a few hours stopping at select restaurants to sample their speciality cuisine. My husband and I signed up for one of these tours during our recent trip to San Francisco. Our group that day comprised 3 journalists from France, their tour guide, their interpreter, and the two of us. We were fortunate to have a young lady called Margherita, who was enthusiastic and efficient, as our guide from Avril for this walking tour. The meeting place, or shall I say rendezvous as there were French people with us, was the iconic Womens' Building in the Mission District. One can't possibly miss this because of the many colourful murals painted on its walls. We introduced ourselves, spoke of the kinds of food we liked and were briefed about the tour. Then we set off for our first port of call, Craftsman and Wolves for the first of the appetizers. 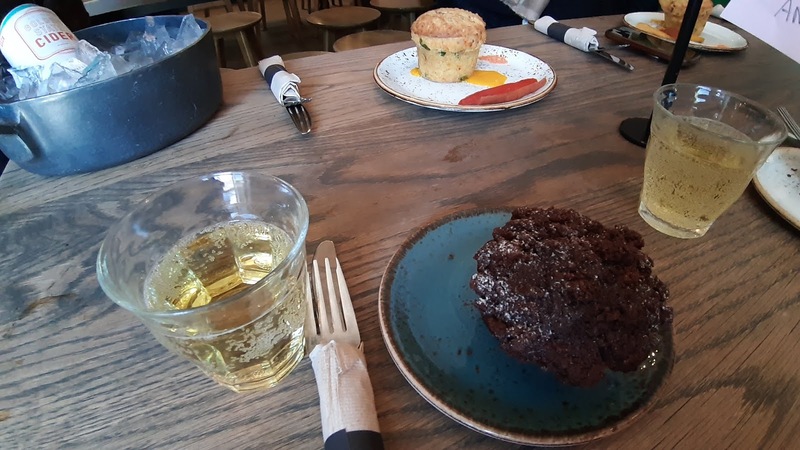 We had the Carrot and Chocolate Muffin paired with Dry Cider while the others had the Rebel Within, a cheese and sausage muffin. Margherita explained the origins of the restaurant and told us about Chef William Werner and his creations. We then dropped in at Mission Cheese for the second appetizer. 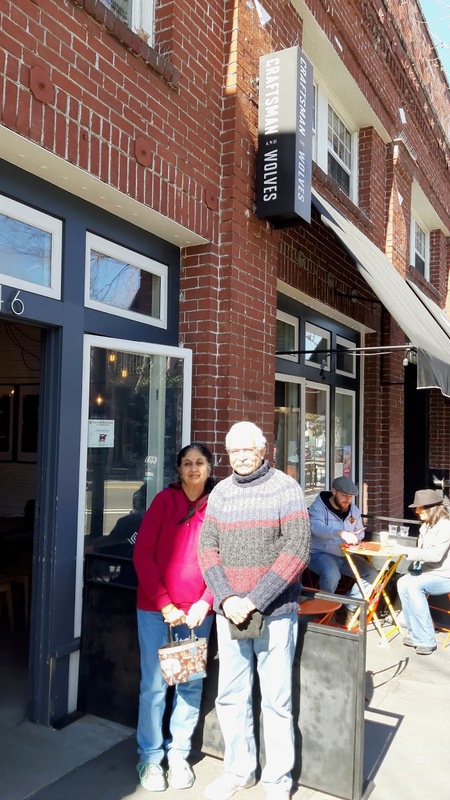 This chic cheese cafe is famous for serving and selling only cheese made in the United States. We were surprised to know that so many different types of cheese were made in the US. 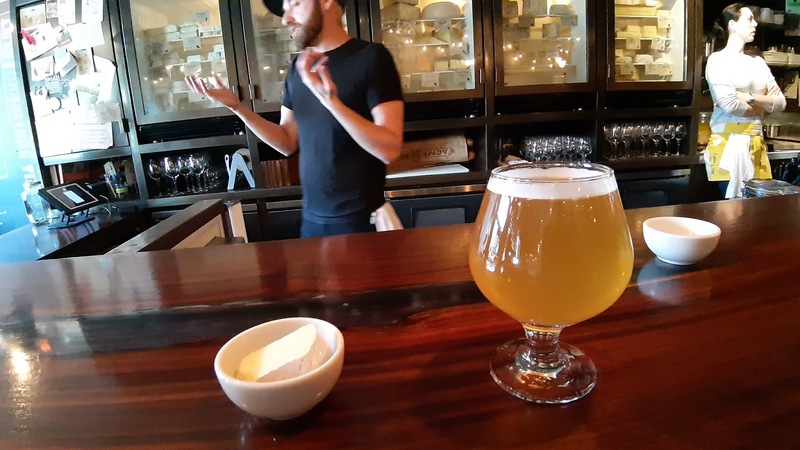 We were asked to guess the cheese as we tasted the samples along with locally brewed ale. Of all the cheeses that we sampled, we liked the Gouda the most. 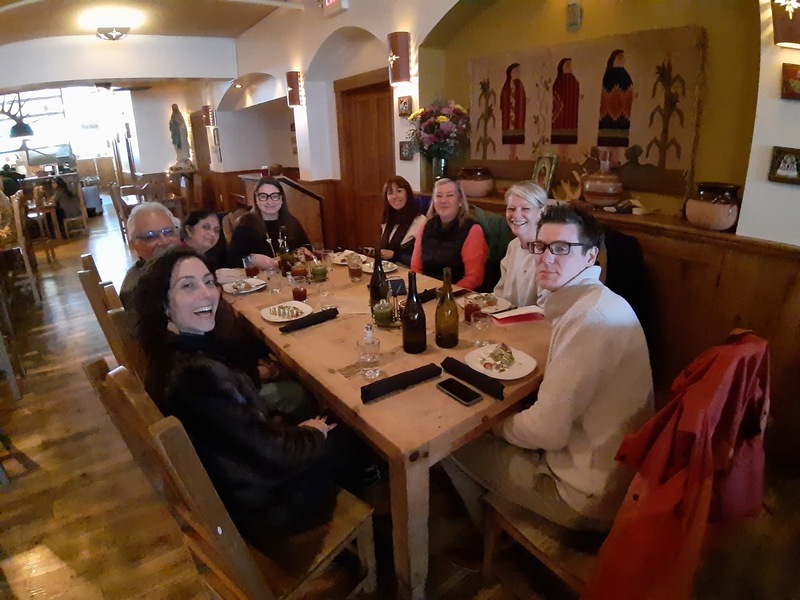 For the main course or entree we went to Gracias Madre, well known for being the first Mexican vegan restaurant. 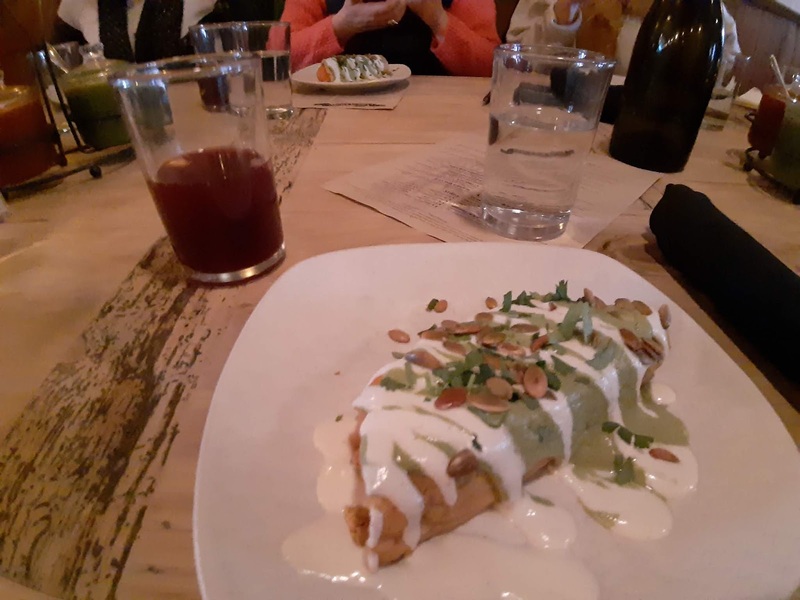 Here we loved the Quesadilla with Cheese and Sweet Potatoes which was truly delicious. Dessert was the Salted Caramel Ice Cream, considered one of the top five desserts in America at the famous Bi Rite Creamery in Dolores Park. This was awesome!! 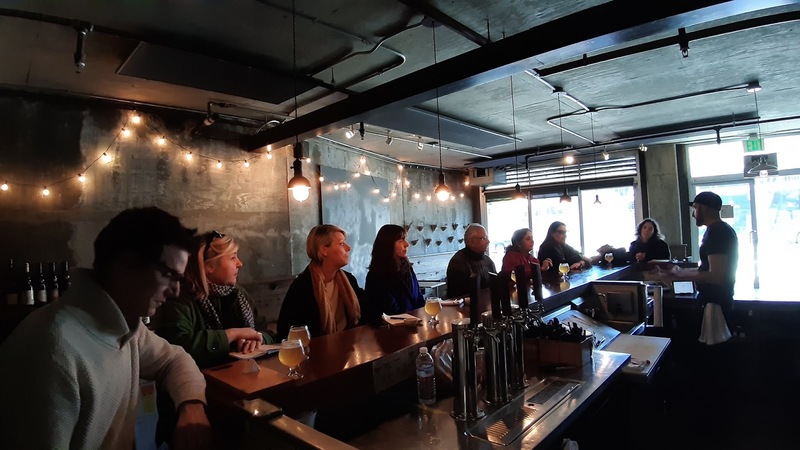 Overall, it was a most enjoyable tour where we tasted what for us was a variety of new dishes. Fortunately, the weather gods were kind to us that day. It did not rain at all for the duration of our tour which made it easy for us to walk from one restaurant to the other. 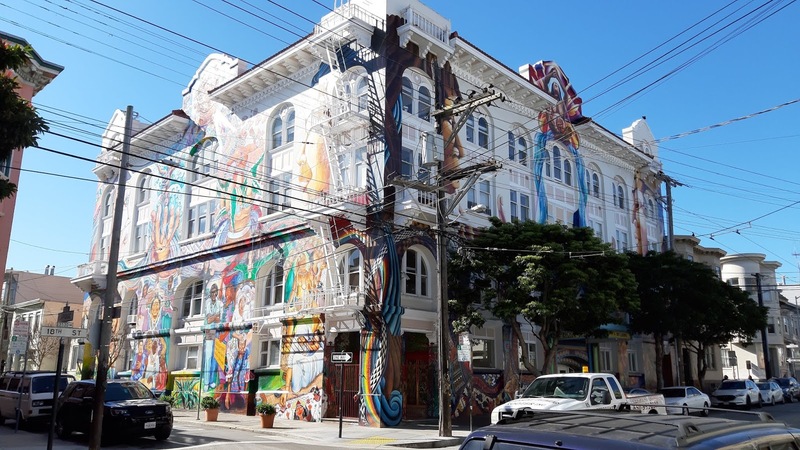 If you are visiting San Francisco, you may like to add this tour to your plans. For details of the tour, do contact Avital Tours. I am sure you will enjoy the experience. Raw/Green Bananas are known to be rich in fibre and potassium. They are often used in dishes made in the South Indian states of Kerala, Tamilnadu and Karnataka. In Malayalam and Tamil, raw/green bananas are called Vazhakka. In Kannada, they are known as Balekayi. Being good for health, I make dishes using raw/green bananas from time to time. 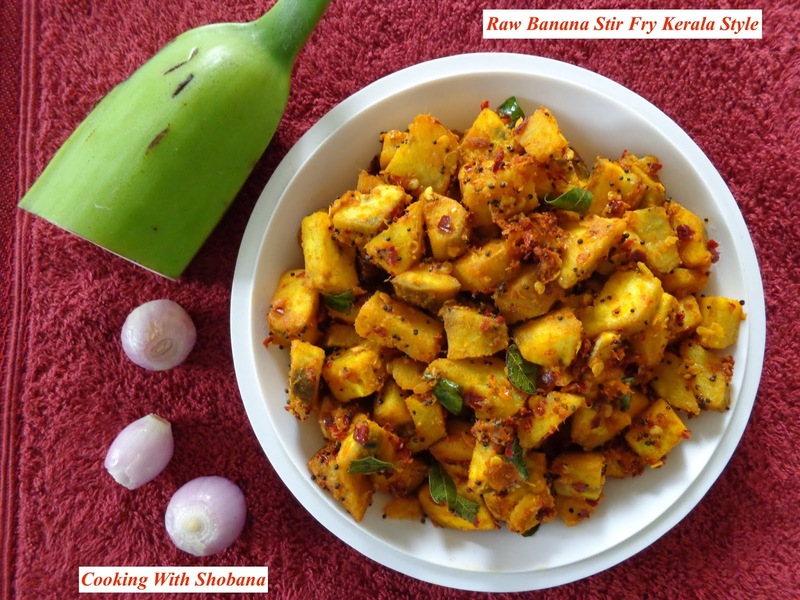 Elsewhere in this blog, you will find recipes for Vazhakkai Poriyal, Raw/Green Banana Roast, and our own Kele Koddel from Konkani cuisine. Today's recipe uses coconut oil for the authentic Kerala touch. 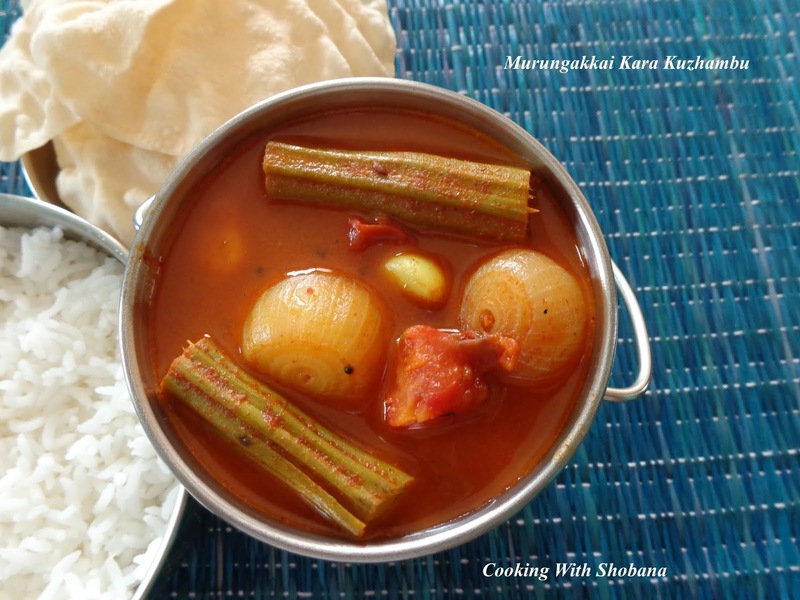 This dish has been adapted from Vazhakka Mezhukkupuratti in the well known website Padhu's Kitchen. It is served as a side dish and accompaniment to the main meal. In the summer months, Drumsticks are one of the commonly available vegetables. In my house, we are all fond of drumsticks, which we call "Mashingasaang" in my mother tongue, Konkani. They are called Nuggekayi in Kannada, Muringakkai in Tamil, and Shevage in Marathi. Elsewhere in this blog, you will find recipes for dishes made with drumsticks such as Potato & Drumsticks Upkari, Drumstick Tomato Curry, and Drumsticks Pithla. Today's recipe is for a dish from Andhra cuisine. It is called Iguru and is a thick gravy usually served as an accompaniment for hot rice. This is adapted from the YouTube Video for Drumsticks Igru by Subbu's Kitchen. We enjoyed this dish and I hope you will like it as much as we did. Wash and chop the drumsticks into 2 " pieces, peel them and keep aside. I prefer to peel them but you can use them without peeling them too.